Why Are Everyone’s Taste Buds Different? Everyone says I am the world’s pickiest eater, and I find it annoying because it isn’t my fault that I don’t like most foods, it’s my taste buds’ fault!! I always wonder why my taste buds don’t like certain foods so here is a blog on it. 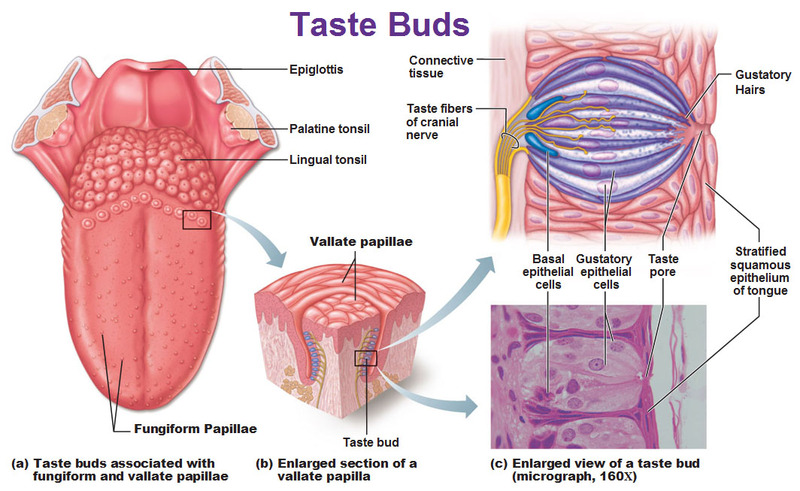 Papilla is the little bumps that we all have on our tongues. People who have a ton of bumps usually find flavors to be too much and don’t like the taste of things, LIKE ME. We have sensitive tongues so we like things mild and toned down. While people who do not have a lot of bumps on their tongue like spicy things and their tongues can handle foods like that. 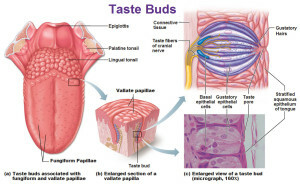 Another factor in liking different tastes has to do with the tongues taste bud’s ability to detect molecules in the food. Everyone can recognize the 5 tastes, but the different chemicals that we all have can make the range of those tastes differ. In high school we did this taste experiment in psych class. To find out how sensitive your tongue is, you can put blue food dye on your tongue. If your tongue doesn’t get very blue then you have way more taste buds, and your tongue is more sensitive to taste. If your tongue turns very blue then you have less taste buds and you can usually have more flavors and spicy food! People’s tastes also are different because of the sensory capacities for the different tastes. “The sensory capacities of your taste buds are dictated by the structure of the receptors on your taste cells, and on their capacity to excite the process of transmitting the taste message,” (TasteScience). The receptors catch the molecules that touch the front of the taste cells. After, they direct a message in the cell to the nerve endings around the cells. The different structure that everyone has come from their genes. Another factor that plays into what you taste is trigeminal sensitivity. This means the different reactions to cold and hot. Foods of course trigger the tastes, but they also trigger the trigeminal sensitivity on the temperature. For example, some people like the cooler taste of mint, and some like the warmer taste that cinnamon has. Roche Institute of Molecular Biology in New Jersey has researchers that just discovered a protein messenger inside of our taste buds. It is called gustducin and activates when we eat sweet and bitter things. Dr. Robert F. Margolskee said that gustducin performs as an intercessor for the sweet stimuli and a chain that sends messages straight to the brain to inform it that it is a sweet taste. Dr. Stephen D. Roper does most of his research on a freshwater lizard. He does this because the lizard’s taste buts are a million times bigger than human’s taste buds. This makes it easier to record the cells responses to different food. Dr. John Teeter and Dr. Joseph Brand use a catfish for their research because it has taste buds all over its body on the outside. This entry was posted in Uncategorized on October 22, 2015 by Courtney Michelle Walker. This is really an interesting posting, since I am always blamed by my mother to be too picky! I do believe that each person’s taste buds vary, but they do can be proved. Sweet, salty, sour, bitter and umami are the five basic tastes. Recently, I read an article talks about “Japanese researchers suggest the ability to taste umami food could have an effect an overall health. Study states that people who had lost their taste for umami also loss for their appetite and weight. My one question after reading this post is if these lizard tongues are anything like human tongues? We always here about tests being done on different animals, typically animals like mice, but never something like lizards. If they aren’t actually similar, would this affect their findings in stating that this is the same for humans? I thought this post to be interesting, especially since I am the type of person that can tolerate very hot drinks. My friends always wonder why I can drink a hot cup of coffee or hot chocolate right after it is served to me, and now I know! From your post I have learned that I am a someone who can tolerate various flavors, but how these studies really conducted? What are the sample sizes of people? Is the study observational or a randomized control trial ? How do scientist know whether or not the amount of taste buds you have your mouth affects the way you taste?